Source: I purchased a copy. Rod Campbell loves going to his grandfather's farm with his friends to tube down the river. 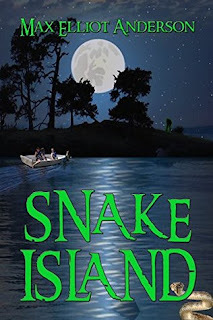 As they float past Snake Island they talk about the different stories they have heard. It seems to be that every generation of boys needs to spend the night on Snake Island to prove they aren't scared. Few make it the whole night. Rod and his friends, Mark, Terry and Ken decide before the summer is over they are going to do just that. The trick is they must convince their parents to let them. Rod's grandfather has offered to pull his boat down to the river and to cart their stuff down with his tractor Before they go Rod hears the island was originally called Hobo Island. He spends days at the library learning all about the hobos, their lifestyle and the island. He has a run in with Mr. Paterson. Everyone around town talks about what a hero he was in the war, and how great he was in high school. Then they talk about how the war changed him. He warns Ken about the island. Rod learns that things were buried on the island. He and his friends go to the island with a metal detector and find a silver box with coins and metals. They divide things up. Then they make final plans to spend the night on the island. They begin by eating with Rod's grandpa and he tells them old scary stories about the island. Once on the island they set up camp and tell their own ghost stories. Later on they hear a noise and go to find out what is going on. What they see terrifies them. They see crazy Mr. Paterson bury something in a hole. They are so scared they leave the island and spend the night back in Rod's grandfather's barn. A few days later a body is found on the island. But are things really what they seem? Did the boys witness the killer burying the body? I absolutely loved this book. It kept me on my toes. I kept wondering what the boys would find on the island. Then I wondered what kind of danger they would find themselves in. One thing about this author's books is that they are not only filled with adventure, but also have some sort of mystery to them. This is a must read book.